"2084 works perfectly thanks to the twin powers of simplicity (it was filmed in director Taz Goldstein's living room) and hilarity (the 'annoyed computer voice' has seldom been so well-executed)." "Taz Goldstein made a funny and high-quality short film using a green screen in his living room. " "...pokes fun of the trope of the all-knowing, all-seeing evil computers found in sci-fi movies like TRON." "...puts the 'Oh well' in Orwell"
Google Translate told us this is in Turkish... but that's as much as we could figure out. 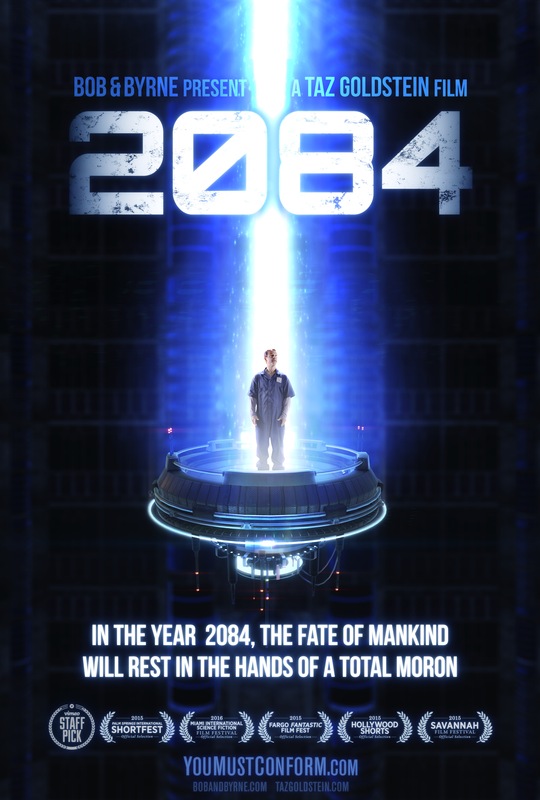 "...you've been warned, 2084 will really make you crave doughnuts." "When you try to take away everyone's free will with the power of fear, you'll occasionally run into someone who's not even smart enough to be afraid." "This three-and-a-half-minute clip will not only have you rolling in the aisles, it might make you crave sugary confections too." "Before this is over, you might even feel a little compassion for Big Brother." "a project in a class by itself...We expect the best to come from Taz Goldstein..."
"Perhaps stupidity is the key, as AI may not be able to cope with that inherently human skill of being as dumb as a box of rocks." "It's cool to see everything they accomplished with so little." Please direct press inquiries to our Facebook and Twitter accounts.